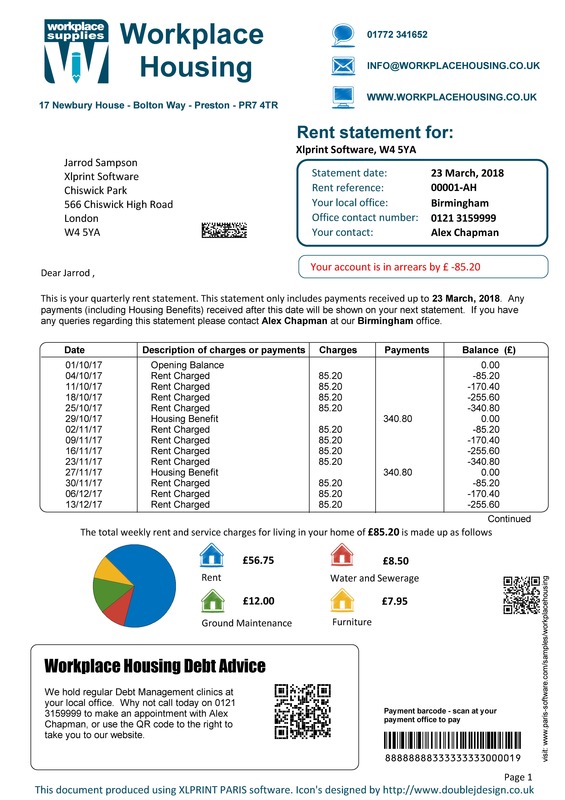 This sample shows how Paris can be used to add significant value to housing organization's transaction documents like rent statements, arrears letters and repairs notifications. High quality, structured and clear communications with data driven content relevant to the recipient and added features like payment barcodes have been shown to improve positive outcomes. This coupled with the fact that more streamlined documents in terms of format and content, mail consolidation for single-enveloping and automatic electronic delivery can significantly reduce the cost attached to production and delivery of these documents. Further added value has been achieved by including data driven charts, real time calculations, automatic text generation and additional relevant and personalized content. calculations, automatic generation of additional text and system generated data. Paris gives full control over the format, content, positioning and style of documents and also automation of delivery to a number of delivery channels.